Available through the author using our PayPal secure ordering system. Paperback $20.00 plus tax. Price includes 3-5 business day delivery by USPS. 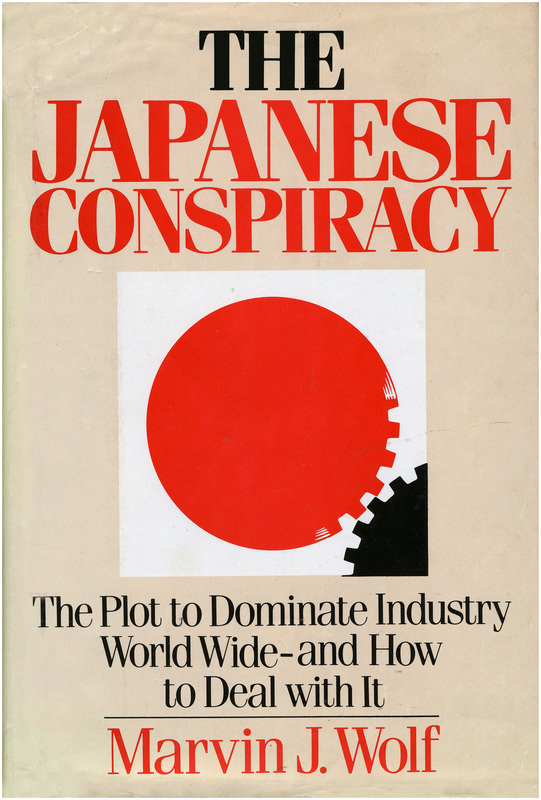 Marvin J. Wolf's shocking book, The Japanese Conspiracy, The Plot to Dominate Industry World Wide and How to Deal with It (1983) exposes the hidden goals of Japanese Bureaucratic-Industrial Complex to gain absolute economic supremacy of all Asia and the world. At the end of WWII, Japan lay devastated, a defeated power whose plan to control all of Asia was in ruins. Decades later that same nation has not only been rebuilt but enjoys a multi-billion dollar trade surplus with the rest of the world and is finally reaching its goal of becoming Itchiban or #1. Only this time its tools are not military, but economic warfare. But the Japanese people's skill and productivity, though impressive, is not the major reason for their stunning international success. Behind their massive penetration of foreign markets is a system of business activity which can best be described as economic totalitarianism - a government-directed enterprise in which all the energies of Japan have been mobilized to overwhelm the world competition. The elements that comprise the conspiracy come from every facet of Japanese life: unelected bureaucrats; industrialists; the reconstituted cartels; labor union officials; politicians; and of course millions of submissive workers. Much of their advantage is based on unsavory practices: Japan has copied foreign technology or acquired it through joint-venture agreements then later disavowed. Japanese Industrialists regularly use every device to achieve their goals, including espionage, cartel practices, secret government subsidies, targeting and dumping and violation of anti-monopoly laws. Its industries often act in concert, as did the prewar Japanese cartels, targeting competitors in other nations and dumping products at a temporary loss in order to win larger and larger shares of world markets. The command post of this new Japanese aggression is MITI, the Ministry of International Trade and Industry, which has targeted one Western industry after another—computers, semiconductors, television, typewriters, aircraft, earth-moving equipment, machine tools, and pharmaceuticals—all for conquest naturally. In a carefully researched narrative, Wolf takes the reader through the destruction of the American television industry, describing how Japan illegally dumped vast numbers of color television sets through cooperating American retail chains. He shows how the Japanese are weakening the American machine-tool industry by using national gambling revenues to subsidize the sale of heavily discounted machines in America and Europe. In the semiconductor industry, he relates how the Japanese "borrowed" American technology, then simply undersold American and European manufacturers, thereby eliminating one after another. He warns that the Japanese now spend billions in joint government/corporate research in order to pass the West in such knowledge-related industries as office automation, robotics, supercomputers and artificial intelligence—the keys to the 21st century. Wolf goes behind the shoji screen of Japanese correctness and portrays a civilization which achieves much of its power through the ruthless exploitation of its workers, women and minorities, including several million untouchable etas. He destroys the myth of paternal management and lifetime employment by showing that this affects only one in three Japanese workers, while millions of others are temporary or part-time employees without job security, benefits or a future. Japanese obsession to win at any cost is traditional and that their concepts of right and wrong are quite different from those of the West. The Japanese Conspiracy cautions the West that unless it forces the Japanese to change, they could eventually spell ruin for America and Europe. A must read for everyone.